I've been reading Chaunie's blog Tiny Blue Lines since before I even had a blog. I loved her honest, raw, and hilarious accounts of being a young mother. Before I ever thought about having kids, I loved her posts, and then when I was pregnant and had a baby, her writing became so important to me, as she covered the real life topics which many other mom writers steer clear from. When she announced she was writing a book I was thrilled for her, and lucky for me, she sent me a preview copy to read! Even though I had an infant at the time, I plowed through the book and loved it to pieces. First of all, there is no other book on the market like Tiny Blue Lines. Chaunie addresses a group of young women who aren't normally considered when discussing pregnancy: college-age, college-educated young women who aren't "teen moms," but, have a life plan, goals, dreams, and just happen to be young and have gotten pregnant. I really respect that aspect of her writing: she doesn't beat around the bush, she wanted a family, just not at that moment. Tiny Blue Lines is the journey of a scared young woman, in college, as she finds out she is pregnant, and is determined to continue on with her life, albeit, wearing maternity clothes. When discussing book reviews, you could not have chosen someone further from Chaunie's background to review this book, which is another reason I really enjoyed reading it: it opened my eyes! I'm a Jew-ish, Unitarian-ish, college educated woman from the Northeast who uber-planned my pregnancy. She was a college aged, Catholic woman who had an accidental pregnancy. However, Chaunie is warm, welcoming, and engaging in her writing. It doesn't matter how old or young you are: pregnancy can be scary and isolating, and Chaunie does her best to make all young women feel not-so-alone, normal, and loved. Tiny Blue Lines is truly an inspiring book, full of life, love, and hilarity. I can honestly see this book as a life-changing tool for many young and scared pregnant women. She takes us through all her stories, from finding out she was pregnant, to deciding to finish school, to telling her parents, and more. These stories, and her tips for figuring it all out are invaluable to all women. Not only does Chaunie make the journey a little less bumpy (ha), but she also reminds us that pregnancy is a wonderful blessing, even if it isn't at the exact moment you thought it would be. It is en empowering book for women who want to both be a great mama and live out their own dreams (and live out her dreams, she did! Chaunie is now an accomplished writer, and preparing for her fourth baby!). Chaunie takes young women by the hand and says, "We can do this, together," as she helps them navigate pregnancy, childbirth, school, family, faith, and life. 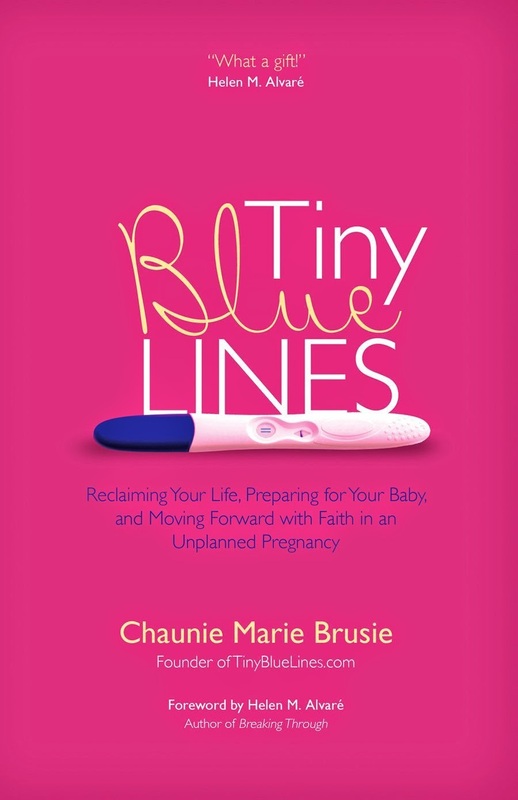 I highly recommend Tiny Blue Lines for any pregnant women, new mama, or anyone thinking about starting a family and also...continuing on with their own dreams. Full disclosure: I was given a copy of this book, but all opinions are mine!